This year marks the 238th Anniversary of the Founding of America. Join us as we relive the events that set America on the path to Independence. We role play the Tea Tax debate that resulted in the Boston Tea Party and the idea of Independence at the Second Continental Congress. You learn to drill and handle a musket culminating in firing a real honorary salute at America's largest Revolutionary War Soldier Burial Ground. Enjoy fine dining at historic colonial taverns and visit the homes of our first three presidents. We even have an overnight encampment where General Washington quartered his Northern Army. This is a living history event that is not to be missed. If you ever felt a patriotic interest in learning more about the Founding of America, then you should learn it by living it. Take advantage of our 10% discount when you book your Founding America Tour before July 15th. Use code: 741776 Dates and rates available here. In this newsletter we present you a fun trivia that will help test your knowledge about America's First Flags. We also invite you to follow the daily historical tweets of Capt. Bartholomew as he marches to Yorktown in 1781. Finally, check out our first person point of view video of the Battle of Saratoga which was shot on the actual battlefield. Read on and enjoy! 1. Which flag was the first to be recognized as an American flag by a foreign power. 2. Which flag was named for a member of the Continental Congress and chosen to represent the flagship of the first Commodore of the American Navy? 3. Which flag was created from a declaration of the Continental Congress ordering the establishment of an official flag? 4. This flag has 13 stripes in alternating red and white and 13 stars against a blue background. Why is this flag famous? 5. On board for one of the most famous naval engagements during the American Revolution, this flag is also known as the Serapis flag, after the British ship that was captured during the battle. Which one am I? 6. 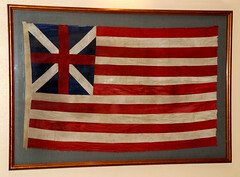 Featuring a Union Jack design, this flag was brought into battle against the British by George Washington in 1776. 7. Which flag was named for a famous naval fighter in the American Revolution. 8. This flag features a rattlesnake, a popular symbol at the time for the American colonies. Who was the first person to use a snake to represent the American Colonies? Relive history through our historical character actors. Experience the sites of the Revolutionary War including Boston, Lexington & Concord, Fort Ticonderoga, Saratoga, New Windsor Cantonment, Fishkill Supply Depot Burial Ground, Valley Forge, Philadelphia, Annapolis, Williamsburg, Yorktown. Dine in historic taverns, where our Founding Fathers dined. - Tour the homes of America's first three presidents; Mount Vernon, Peace field, Monticello. Roll play the assembly at the Old South Meeting House that precluded the Boston Tea Party. Live the colonial life in Williamsburg, VA including full access and two night programs. All Walking tours led by professional licensed guides and reenactors. Enlist in the Continental army and live like a soldier during an overnight encampment at Washington's New Windsor Cantonment. Step aboard the U.S.S. Constitution and learn about life at sea. Are you ready to defend your rights? click here for more information and to register. Have you ever wondered what it was to be in the front line of the American Revolution? Come along with private Scott MacScott of the 5th New York Regiment and experience the Battle of Saratoga from his point of view. We placed a camera in his tricorn hat as he reenacted the battle on the actual historic Saratoga Battlefield. This is not how Hollywood glorifies war, but rather the slow methodical 18th century open field engagement that was typical of the day. 2.) You subscribed to an educational list.